Having guests in town, I decided to book one of Captain Steve’s snorkeling trips as they were keen to get out onto the ocean and experience the amazing sea life off of Maui. They were looking forward to a thrilling ride on-board an ocean raft to the islands of either Lanai or Molokai, both being snorkeler’s heaven! I chose Captain Steve’s as these trips are ideal for first time snorkelers due to the small groups and individual attention clients receive. Their two hard-bottomed inflatable vessels, the Canefire and the Canefire II, would get us there safely and quickly. Being first-time snorkelers, we put our trust in them a nd we were not disappointed! 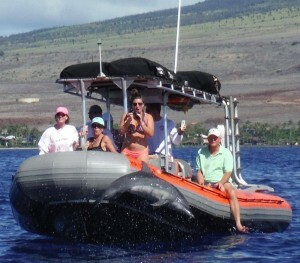 We took the snorkel and dolphin trip to Lanai during whale season and we couldn’t have asked for a more perfect day. The whales were out in full force – we saw a shark swimming in the water and as we were watching him, a whale breached right in front of our boat. We had several pods of whales clustered around us at one time during the trip. There were also huge pods of bottlenose dolphins swimming off the shore of Lanai giving us quite the show! The snorkel sites were great too, we felt very safe and they provided us with high quality fins, masks and snorkels. The raft had dual ladders with wide steps to enable easy water boarding, which helped tremendously. Lunch was plentiful and delicious. The Captain and crew were very friendly and went out of their way to ensure we had a fun and memorable experience. My guests had a blast! Captain Steve’s is definitely on my to-do list for all my incoming visitors. 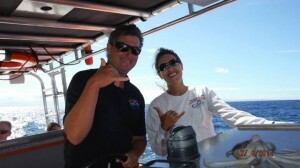 You can book a trip with Captain Steve’s by clicking CaptainSteves.com, or calling 808-667-5565.